It think it’s safe to assume that if you’re the owner of a Catalina/Morgan 38, no one will ever single you out in a remote anchorage to offer praises about your handsome vessel. On the other hand, when friends and fellow sailors are invited aboard, they are quite likely to offer praises for the roominess, accommodations, and practical layout of this model. In May of 1984, Catalina Yachts acquired Morgan Yachts of Largo, FL and continued to build Morgan’s designs as the Morgan Division of Catalina. In November of 1992, they introduced the Catalina/Morgan 38—the first completely new Morgan model in more than 10 years. And, while the name may suggest Charlie Morgan had something to do with this model, in fact, the design is by Catalina’s in-house staff led by Gerry Douglas. Sometimes called the Catalina/Morgan 38, the Morgan 38 CC or the Morgan 381, she was not destined to become one of the company’s more popular models—fewer than 100 boats were built through the remainder of the decade. Like her sister Catalina models, the Morgan 38 is constructed of a typical layup of fiberglass cloths, resin, and core materials for localized reinforcement and stiffness. Components are fastened together with fiberglass cloth and resin, structural adhesives, or both. The deck component is fit overtop the hull in a shoe box fashion and finished on the exterior with an aluminum rub rail with vinyl insert. The rub rail is small for a nearly 18,000-pound boat and easily damaged by minor docking incidents, but otherwise, few serious construction problems are reported except for what seems to be a greater than average number of persistent leaks at the attachment of hardware, windows, and ports. As is typical of center cockpit, aft cabin models, the deck arrangement is, to a large degree, dictated by the large deckhouse necessary for the below deck accommodations. The foredeck anchor locker is small in order to maximize the space in the v-berth cabin, although the designers have maintained plenty of side deck width so that you don’t have to step up onto the cabin trunk in order to get from bow to stern. The cockpit is long but quite narrow in order to allow adequate headroom in the galley and head below. Mainsheet and genoa sheet winches are within easy reach of the helmsman, and halyard winches are each side of the companionway. The aft deck is very large considering the LOA and features unique port and starboard molded fiberglass steps to a sugar scoop swim platform. The interior arrangement is, in my opinion, about as good as it gets for a 38-foot live-aboard, coastal cruiser. Most unique is that it is laid out for only four people while similar models attempt to cram in accommodations for six or even eight. There are two heads which, in my view, is a waste of space, but the forward head could be easily converted to storage. The companionway at the forward end of the cockpit leads to the main saloon, which has a small but adequate navigation station to the starboard side of the steps. Forward of the navigation station is a settee, the center section of which can be raised to desk/table height separating the settee into fore and aft seats. To port are a settee and dining table which require a couple of extra folding chairs in order to seat four for dinner. Forward is the v-berth cabin with a small head and integral shower to port and hanging locker to starboard. The galley is along the port hull side at the passage from the main saloon to the aft cabin. It is remarkably roomy with stove, icebox, and freezer outboard and sink inboard. Counter space is excellent and storage adequate. Opposite is the master head and separate shower with access from the main saloon or master stateroom. The aft master stateroom features a centerline, queen berth with upholstered seats on each side. There are a chest of drawers to port and hanging locker to starboard, drawers and fuel tank below the berth, and additional storage in top-loading bins each side of the berth. There are two large opening hatches in the aft cabin for excellent ventilation and emergency exit, although the transom-mounted hatch often leaks with a heavy rain, likely because the hatch’s designers never intended it to be mounted in a vertical position. Auxiliary power was usually provided by a Westerbeke marine diesel engine, although a few were powered by Yanmar engines. Either provides sufficient power. Engines are mounted beneath the cockpit deck, and galley counter and access, particularly to the starboard side of the engine, is limited. There are removable panels, doors, and access ports next to or above service points for normal maintenance. Although manufacturer’s literature lists the Catalina/Morgan 38 as being offered with a deep draft (6’ 6”) fin keel, I have never seen one, and all of the boats currently offered for sale or sold within the last year were equipped with shoal draft fin keels. The sail area/displacement ratio is a rather conservative 16.6, and the majority of boats were equipped with less efficient, in-mast furling mainsails. These features tend to lead to less than impressive weatherly and light air performance; although, when compared to other cruising boats of this style, most sailors are likely to be quite satisfied with performance. 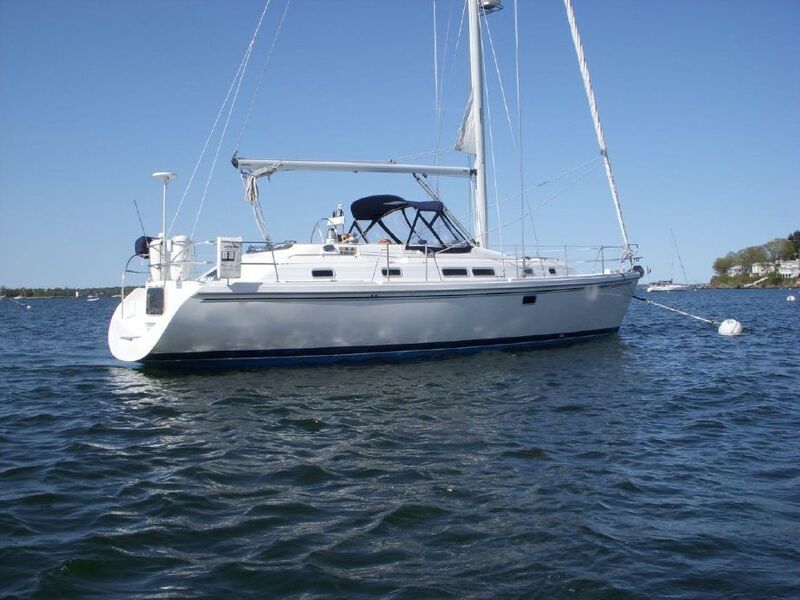 In late January 2007, 10 Catalina/Morgan 38s were offered for sale at www.yachtworld.com with asking prices ranging from $104,000 to $160,000. The subscription website www.soldboats.com listed the selling prices of three boats sold in the last year from $108,000 to $144,000. Although a bit higher priced than other 38-footers of this age and quality, the Catalina/Morgan 38 offers a practical layout that is appreciated by live-aboard, coastal cruisers. If these are your sailing and cruising plans, this is a boat that deserves serious consideration.